Does worn-to-death jewellery strike a chord? Like you, we too have our favourite sets of jewellery that we fall back on for our everyday outfits, up to the important events in our life. Here's our take of the 5 jewellery essentials every woman should own - this might just serve you well for your next splurging itch. Cannot take your eyes off the lovely jade bangles, but uncertain if it's worth the splurge? It might be worth the spend, especially if you see yourself wearing it on multiple occasions. When purchasing jewellery of higher price points, understand what you are paying for. Investing in gold and precious gems are better as these could potentially be heirloom pieces, such as the Cherry Blossom Jade Bangle in 18KT solid gold. In addition, our jade bangles undergo rigorous authenticating process to ensure a high quality standard. Depending on the design, drop earrings can be feminine, fun, and elegant. Earrings rank high on our list of must-haves simply because of its ease of use and functionality. Positioned next to the eyes, drop earrings are one of the first pieces of jewellery that catch the attention of on-lookers. One of the best forms of self-expression we say! For a stylish yet sophisticated look, pair your outfit with the Peranakan Flower Drop Earrings. Not one to fancy just one design, or simply want to have it all? We find ourselves stuck in that dilemma too. The next time you shop for rings, settle on a piece that is outstanding on its own yet versatile enough to complement other jewellery. Our favourite is the Hydrangea Jade Bead Ring in 9KT solid gold. Pearls are perhaps one of the most precious gems, much like diamonds. A great wardrobe essential, it pairs both with your black dress to cocktail parties or denims for a dress down yet fashionable look. Take it from people who might know better. In the words of the 35th First Lady of USA, Jackie Kennedy, "Pearls are always appropriate". The Peranakan Lace Pearl Bracelet with freshwater pearls comes in lush cream and a limited-edition silver. If you're going to wear something all year round, make sure it's worth showing the world. It can be a piece that tells a personal story, or a design that speaks of symbolism and meaning. The Choo Yilin ready-to-wear collections are often inspired by natural elements that embody the traits of a modern and empowered woman. 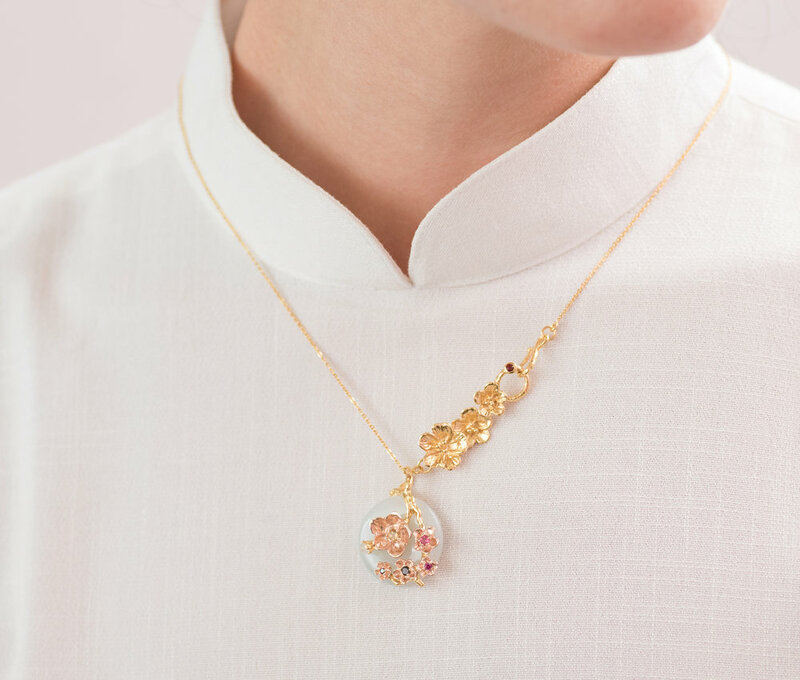 For instance, the Cherry Blossom Branch Necklace in 9KT solid gold celebrates nature through the intricate weaves of branches and flowers.